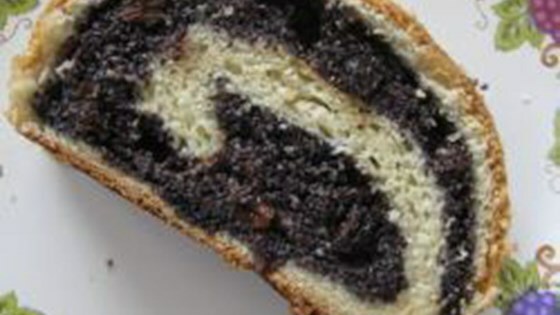 "This wonderful poppy seed stollen recipe is straight from Germany. It tastes best if you can freshly grind your poppy seeds. In Germany there are special poppy seed grinders, but you can use a mortar and pestle. Don't use a regular spice grinder, as poppy seeds contain a lot of oil and your grinder will get clogged up." Place flour in a large bowl, make a well in the center, and crumble fresh yeast into it. Pour 1 cup lukewarm milk into the well and stir into the yeast. Cover and let rise in a warm place until foamy, about 15 minutes. Mix flour from the sides of the bowl into the yeast mixture, a little at a time. Add butter, 6 tablespoons sugar, and salt and knead until a soft, pliable dough forms. Cover with a clean dish towel and let rise in a warm place until doubled in volume, about 1 hour. Grease a baking sheet with butter. Sprinkle a work surface with flour and roll out dough into a thin rectangle. Pour poppy seeds into a bowl and pour 1 cup hot milk on top. Add 3/4 cup sugar, raisins, honey, vanilla sugar, rum, and lemon zest and stir together until filling is well combined. Spread filling over dough rectangle. Roll up rectangle, starting at the longer side, and press seam together with your fingers. Place poppy seed stollen onto the prepared baking sheet with the seam side down. Cover and let stollen rise for 20 minutes. Bake stollen in the preheated oven until baked through, about 40 minutes. Allow to cool for about 1 hour and dust with confectioners' sugar.